Nothing gets the attention of someone in Hong Kong like the words “Full breakfast served”. This morning there were hundreds at a session hosted by Michael Page. a leading professional recruitment consultancy (not a client). Some may have been motivated by the food or the location. The W Hotel in Kowloon is still a trendy destination that merits a trip across the Harbour. Many came because of the hospitality of Michael Page and their newly arrived leader Andy Bentote (thanks for the meal, Andy). Most came for the keynote speaker – Stephen Green, Head of Research, Greater China, Standard Chartered Bank (sadly not a client either). In a masterful 20 minutes Stephen outlined the reasons he titled the speech “The China Recovery”. Growth predictions for this year and next remain at 8%+. Inflation is likely to make a comeback next year leading to a rise in interest rates. Stephen believes China may be one of the first major countries globally to start lifting interest rates. Exports are on the rise to the USA, even if Europe has troubles. Urban labor demand remains high. And to counter a flat outlook for manufacturing, services in China are growing fast. But most important – real estate is on the rebound. Stephen said his peer Jonathan Anderson at UBS calls China’s real estate sector the most important economic index in the universe. Seriously! And why? During construction real estate drives commodity prices – from iron ore in Australia to wood in Brazil. The millions employed in construction drive employment – or not. The crash in construction in 2009 led to a wave of unemployment that sent millions back to their rural villages. Finally completed real estate drives consumption. If you purchase a new unit it no doubt has a car park and is located further from the centre of the city. You’ll need a car (and a toaster, flat screen, quilt set, utensils, furniture…the list goes on). 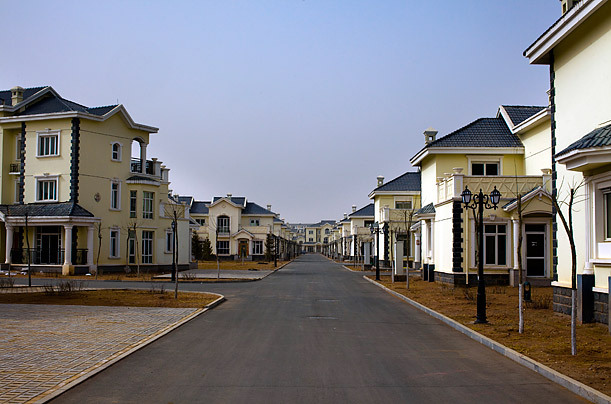 But what about the ghost towns, like Ordos in Inner Mongolia, pictured above? In a country of 1.2 billion people it’s natural for some pockets of oversupply to exist. The fact there are less than a handful of these sites means it’s not a nationwide issue. Today construction is coming back. In Beijing prices have risen up to 30% because the 2009 construction collapse means there’s not a deep enough supply to meet demand. Finally Stephen pointed to the 800 pound gorilla in the room whenever someone discusses China’s economy – shadow banking. In reality these are much like traditional banks. They make loans and charge interest rates, then on-sell those securities to investors packaged as wealth management products. China admits non-performing loans account for 2.9% of all loans nationwide. As that is likely under-reported, Stephen Green said an NPL ratio of anything up to 10% is likely to be no reason for concern. I make light of the depth presented today. Stephen Green presented an excellent economic overview of China that had most in the audience enthralled. There are facts and figures and charts and stats to spare. I could opine on the products in the CPI basket and how pork’s resurgence is a contributor to inflation. I could discuss urbanisation rates of Asian nations and the inflection point where per capita income escalates. And I could discuss the 30 year challenge China faces with land reform. Suffice it to say, whether it was Michael Page or the free breakfast that got you to the event, it was Stephen Green that kept you locked to your seat. Well done – and thank you all. 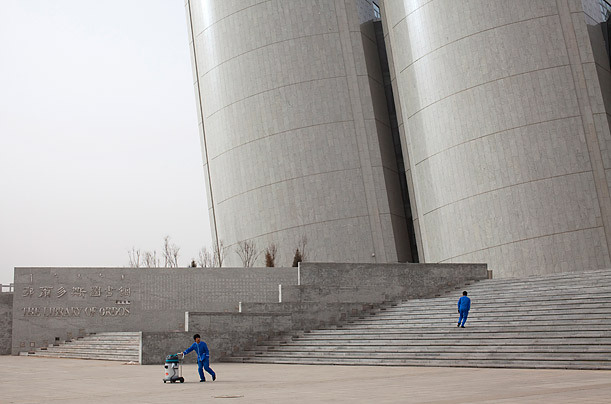 Cleaning up outside the public library in Ordos, China. ← Hong Kong Postcard: Chinese Massage or Prisoner of War Training?